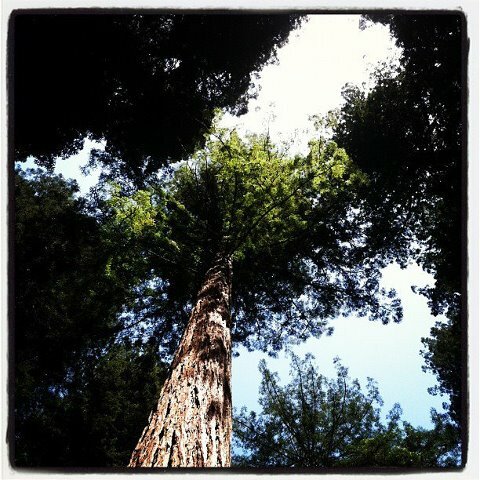 The Redwood trees stood massive and solemn, some close to 300 feet tall, some over 500 years old. I felt small and insignificant under their kind shadows. Like an ant. Or a long-forgotten worry. They once stood silently while the first Europeans docked their ships and slid small boats up on to the sand of East Coast beaches. They grew slowly, ring outside of ring, oblivious to the world tightening around them. “I have to go potty!” Abra exclaimed somewhere deep in the Redwood forest. We had left the last “potty” about a mile behind us. I looked at Mai and shrugged. “I’ll take her back if you can herd these three,” I suggested, motioning towards the other kids. So Abra and I walked back the way we had come. She occasionally darted ahead to show how fast she could run, her long blond hair waving back at me. Just as quickly she stopped, her butterfly-like attention grabbing fully on to anything that interested her. Almost at the restrooms, she ran over to one of those small podiums with some information about an interesting something or other. “I want to read this,” she said. “What about the potty?” I asked. So I lifted her up so she could see the words (she can’t read yet, but she pretends that she can – usually her pretend reading is way more interesting than what the words actually say). The display explained the strange grove of trees right in front of us. A huge grove of six or seven Redwood trees gathered, each one three to five feet in diameter. They had grown in an almost perfect ring. In their midst stood the charred remains of an old Redwood. Before some ancient fire it had reached up higher than a fifteen-story building. Now it was barely fifteen feet tall. The outside of it was black, the hollow inside crumbling. The old blackened Redwood must have died in a forest fire. But its roots had survived, and out of that underground life sprang the circular grove of Redwoods in front of us. The fire could only kill what was above ground, and after a time the new trees grew up out of the old roots. I so badly want my here-and-now to be the thing that survives. I work so hard to protect it, to nourish it, to save it from the fire. But what if my “today” must die in order for such prolific life to rise? What if the destruction of this current beauty must take place so that the root of something even more glorious can push up new shoots through the darkness? I want to hold onto my ‘todays’, too. But what awaits if I let them go, let them die so new life . . . a truly abundant life can spring up in their place? Good (if hard and scary at times) things to think on. Thanks, Shawn! Well put. I hear you. Thanks for the “GIANT REDWOOD STORY”… Now I peacefully go back to sleep, knowing that HE who watches the sparrows flit among those “REVIVED GIANTS” knows what’s best for even me! So poignant and vivid. Great words here.